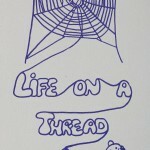 Life on a Thread is an introduction into the study of behavior, using the example of the web-building spider. 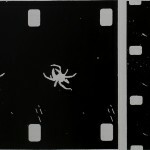 A 20-minute, colored, 16 mm sound film on the building of the geometric orb web and prey catching of the spider Araneus diadematus Cl. (Araneae, Araneidae). Audience: High school and college biology classes, psychology and behavior courses, as well as lay groups can show this film as an introduction. It is intended to stimulate interest in behavior, raise questions, and organize thinking about some aspects of behavior: behavior being defined as movements of the whole organism. Special approach: The film lets the viewers’ eyes explore details as well as overall patterns of an organism’s movements, and observe how such movements fit into nature’s framework, helping a species to survive in its environment. Eight written titles explain general principles, applicable to any behaving organism. A minimum of spoken comments point toward characteristic details in the spider’s movements, as a thread is laid or a prey is caught. It is left to the viewer or the instructor to decide in what depth he wants to use this film: to explore web-building behavior specifically or discuss behavior in general. It may be found advantageous to show the film two or three times; this permits the audience to check preliminary observations and prove or disprove hypotheses formed on first showing. — An intentionally abrupt end to the film is usually followed by a barrage of questions, which can be answered by the instructor or through use of this folder and its reference list. “Life on a Thread”, tries to help the student memorize facts about animal behavior by linking them to the pleasure of watching the beauty of a complex rhythmic movement pattern.